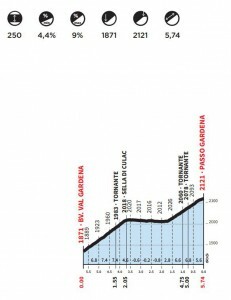 Looking at the numbers, Passo Gardena from the side of Selva di Val Gardena seems pretty easy. 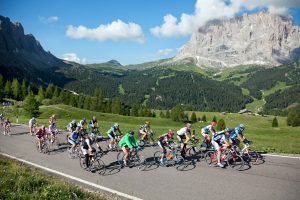 Well, it isn’t hard for sure, but if you’re approaching the Passo Gardena after a long loop – maybe after already climbing the whole Val Gardena or coming from the Passo delle Erbe loop – it may feel like a tough climb. Primarily because, on some parts, the road has a gradient that is usually not that high, so with good legs you should be able to push without any problem. But if you’re tired, you’re not going to be able to go on any farther. Shortly after leaving the town of Selva you have the first hairpin with a long straight that follows the contours of the mountain. Another hairpin with a gradient approaching 10% takes you to another long straight where it’s steeper than 7% in just a couple of sections. You soon reach the winter lift facilities of Plan de Gralba and from here, only 1km separates you from the junction to the Passo Sella or Passo Gardena portion of the famous Sellaronda loop. Once you reach the crossroads, turn left following the Passo Gardena sign. By now you should already know that the more you stay on the inside on the hairpins, the steeper the road is and feels. If you have the power and feel good enough to push out of the saddle, you’ll get good training. But, if you legs are begging for mercy, better take a wider turn. 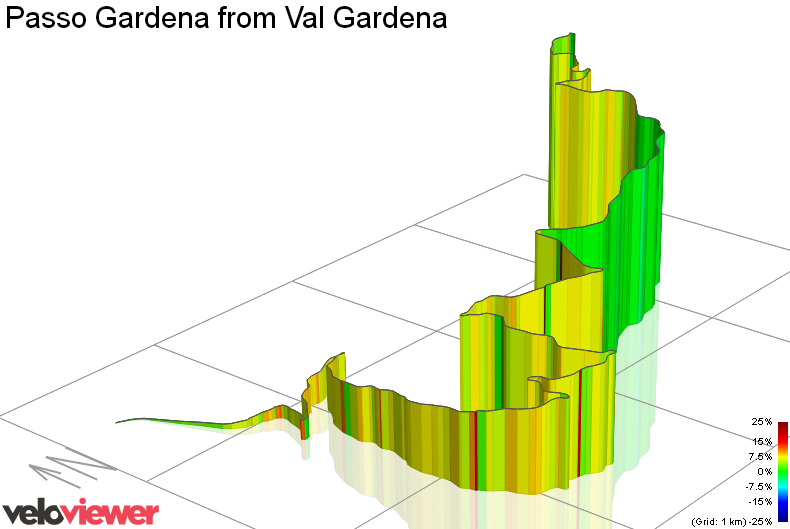 Before the end of the climb you reach a 2 km long stretch that have a gentle gradient downhill. 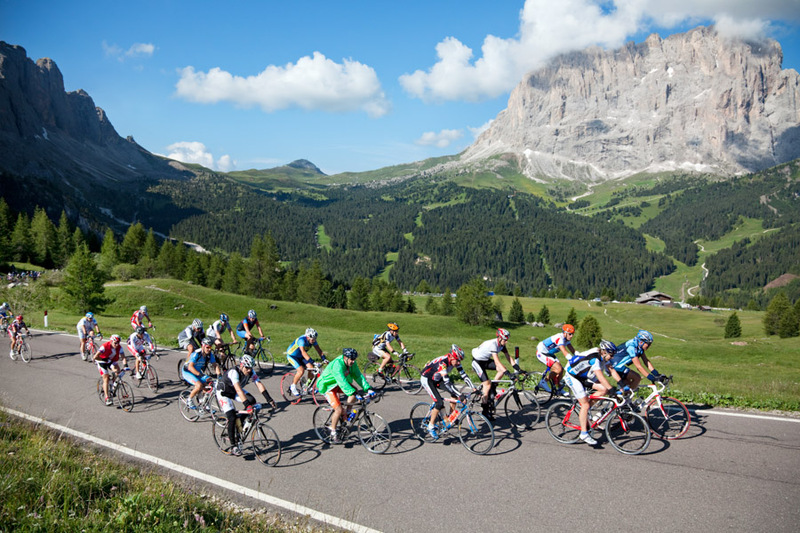 So take away this 2km from the resume above and you will see that the Passo Gardena gains already some more respect. After this long part you maybe feel to take some speed in order to gain some 100 meters speeding up the last 1,8 km until the top of the Gardena. 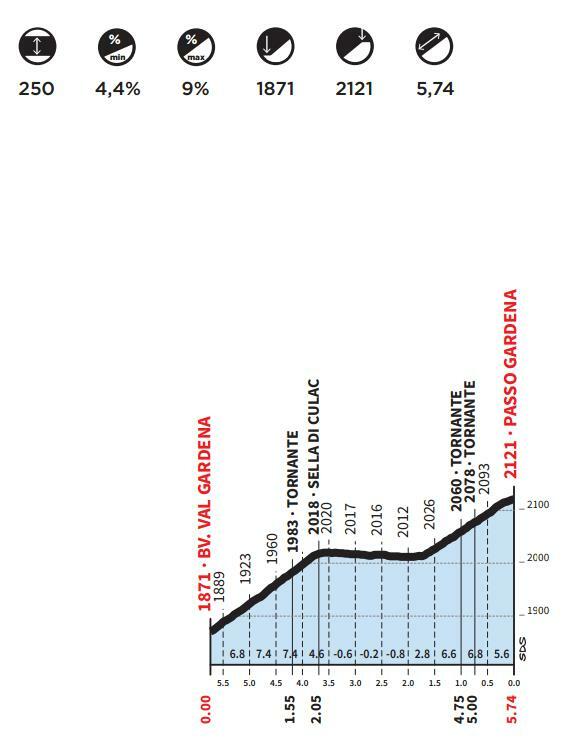 Maybe the speed will last barely for 100-200 meters but only 3 hairpins separates you from the top of the Passo Gardena. Remember to look sometimes behind you because from here you have one of the best views on the Sassolungo / Langkofel mountain symbol of Val Gardena.